"I've always liked to be in charge. Suddenly, I wasn’t in charge at all." The film starts with an empty chair and a simple, monochromatic background. 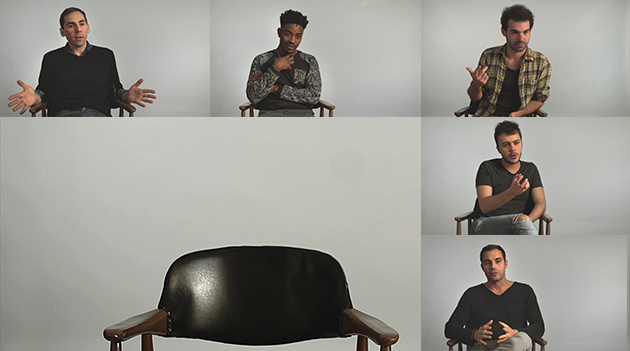 Over the next hour, five men ranging in age from their twenties to fifties sit in the chair and look into the camera—or deliberately away from it. They talk about unexpected pregnancies: how they reacted on learning a partner was pregnant, the complex feelings that arose, and the lasting effects on themselves, their partners, and their relationships. One man is shocked to learn his girlfriend wants to keep the child, and she is equally shocked to realize he expects her to have an abortion. After a midlife crisis, a man feels conflicted when he learns his girlfriend is pregnant, just as the two are about to break up. And a young man who pressures his girlfriend to have an abortion—he thinks she’s trying to stick him with raising someone else’s baby—now feels guilty because he realizes how much she wanted the child. The film shifts among stories, never losing the thread of each as the men remember a pivotal period in their lives. With A MAN’S PLACE filmmaker Coline Grando has deftly made an absorbing, intimate documentary on a politically polarizing subject. This is not a film about men’s rights, nor does it in any way argue men should have a veto on what their partners decide. Instead, it interrogates the experiences of men, including their sometimes reprehensible actions towards their girlfriends. Grando is never on screen, but she is a presence in the film. We hear her asking probing questions, pushing her subjects to go deeper in their reflections. In one case, she questions a man’s dismay that staff at a family planning clinic represented a “stereotypical feminism,” in another she pointedly asks about the man’s role in using contraception. A MAN’S PLACE is a valuable film about abortion that manages to avoid the tired arguments of the abortion debate, while giving men an opportunity to talk about a subject many have never been able to discuss. This DVD is sold with a license for institutional use and Public Performance rights. From the early 1920s until his death in 1969, Dr. Robert Douglas Spencer practiced medicine in a small town in Pennsylvania, where he treated colds, set fractures - and performed illegal abortions. Dually profound and amusing, delves into the "family values" debate via an exposé of women who are single mothers by choice.